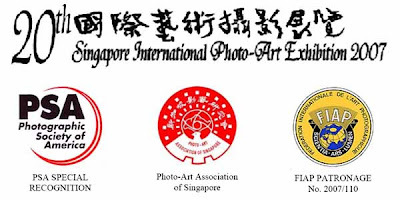 The Photo-Art Association of Singapore (PAS) cordially invites you and photographers all over the world to participate in the 20th Singapore International Photo-Art Exhibition 2007. This exhibition is organised in accordance with the recommended practices and rules of the Photographic Society of America (PSA) and the International Federation of Photographic Art (FIAP). All acceptances are eligible for PSA’s who’s who and Star Ratings. Acceptances are also taken into account in AFIAP and EFIAP distinctions.